One of the growing trends over the last few years that has only recently made its way over to the console scene is the roguelike genre of games that tasks players with having to keep a character alive all the way to the end of the experience, or face having to start from the beginning. One of the newest games to fall under this category is Abyss Odyssey: Extended Dream Edition for the PlayStation 4, an upgraded version of the title which launched last year for the PS3, Xbox 360 and PC. Enhanced with updated visuals, multiplayer aspects and new move-sets, this is sure to be the definitive version for fans, but sadly doesn’t do much to fix some of the game’s fundamental flaws. Like many roguelike games, each of Abyss Odyssey‘s levels are randomly generated, but it does offer a unique twist as it let players decide their own path. With each level working like a single link in a chain, players can decide to descend further down into The Abyss on the same chain, or move laterally onto another chain, which may, or may not be, any more difficult. This gives players the ability guide themselves down a path that works best for them, as well as hunt for better items before moving onto more difficult areas. The big issue for players looking to explore will be that this is a true roguelike title that will force players to restart at the very top if they should fall in battle, but thankfully this is by far one of the most forgiving games from this genre I have ever played. Regardless of which of the three playable characters to choose from, if you are unable to use potions to heal yourself or find one of the numerous health drops that fall from nearly every foe, Abyss Odyssey has at least one more trick up its sleeve to keep you going. Acting as one of its coolest features, players are allowed to switch between their chosen character and one of many souls that they can carry with them that will let them swap into a completely new character, complete with their own moves and health bar. If, after that, a player should fall again, you are granted a single opportunity to make it to a specific shrine to bring back your character or be forced to return to the top only with your experience and gold intact. On top of all of this, there are also camp tokens that give players a checkpoint if all else fails, which will not only keep them going, but also introduce NPCs around that particular level who will help them in combat. Sadly, one of the biggest issues I continually had with Abyss Odyssey has to do with its combat mechanics. After numerous hours of trying to get comfortable with its design, I never felt like the game played to its full potential, as each time you tried to swing at an enemy you could feel the beginning and end of each animation string. This gave it a robotic feeling that I think comes from it trying to utilize a fighting game style system that simply doesn’t work. 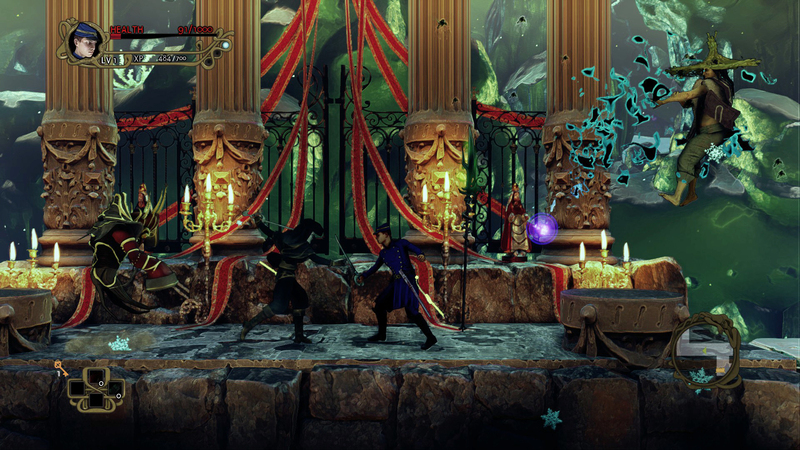 Unlike normal fighting or platforming games, Abyss Odyssey has players use directional attacks similar to Nintendo’s Super Smash Bros. series, as you try to direct your attacks depending on the direction you move the analog stick or d-pad and button combination, but without much success. The root of this really falls into just how rigid each character moves, and the length of their animations that can force players to commit to an action in an environment that requires more adaptability. Trying to move around an area dodging flying orbs that can knock you into a pit, while also dodging swinging axes, there is a level of control that is required to make a game about defeating a level and not its mechanics. While I never really will be able to get past its controls, Abyss Odyssey does offer some interesting gameplay designs that will let players find a significant amount of content if they are able to. Depending on which primary character you use, each one will have a specific type of weapon that can be upgraded through items found in the in-game store, or found throughout one of its levels. Sadly, regardless of whichever character you choose, items in each level are randomly generated, which can leave you to find items that are completely useless for that particular run. Finding souls in the game also offer something of a unique twist on the game, as players are able to purchase them, or capture them if they can perform a special move. Each character also has the ability to slot in three different special attacks, as well as level them up and improve their ability to cancel out of attacks into special moves, but rarely does this add anything to the combat other than the occasional projectile or barrage attack. From an aesthetics point of view, Abyss Odyssey is a really good looking game, as it does a great job of mixing in a variety of environments to keep things feeling a bit fresh. You will still see a number of repetitive layouts as you walk left and right and fall through platforms on repeat as you try to descend, but its colorful nature will help distract you long enough for you to reach your goal. A single playthrough can last you as long as only a few hours if you’re good, but as you level up and try to unlock more content you start to fully understand that the game opens up the more you invest in it. If you are looking to play with other people, you are able to play online with a friend through the story mode, or go through an offline versus mode mode with up to four players going at it in an all out brawl. This does add a bit more content, but ultimately I feel like it relies solely on its weakest assets and becomes nothing more than a novelty for people looking get just a bit more time out of their purchase. Abyss Odyssey: Extended Dream Edition is far from a bad title, as it does a great job of keeping some tension with its lite roguelike design, and it contains more than enough content to warrant its $14.99 price tag. But, if you’re like me, and are particular about how a game should feel on a fundamental level, then you may find that this one is lacking where it matters most.